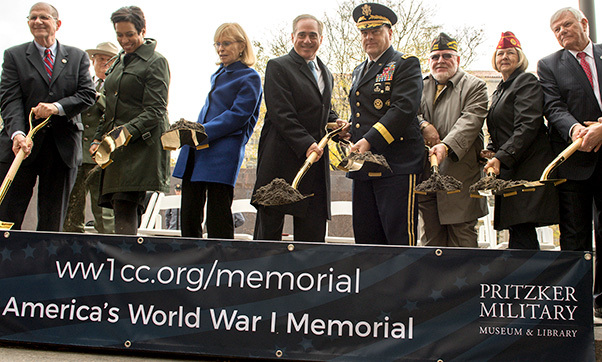 The official party, including Chief of Staff of the Army Gen. Mark Milley, fourth from the right, breaks ground for the National World War I Memorial at Pershing Park in Washington, D.C., Nov. 9, 2017. Construction of the memorial is expected to be completed in a year. An array of politicians, military leaders, veterans and officials from the World War I Centennial Commission officially broke ground for the National World War I Memorial, Nov. 9, at Pershing Park in Washington, D.C. This year marks the 100th anniversary of U.S. involvement in World War I. It was April 6, 1917, when the United States declared war on Germany. The first American Soldiers would make their way across the Atlantic in June of that year. 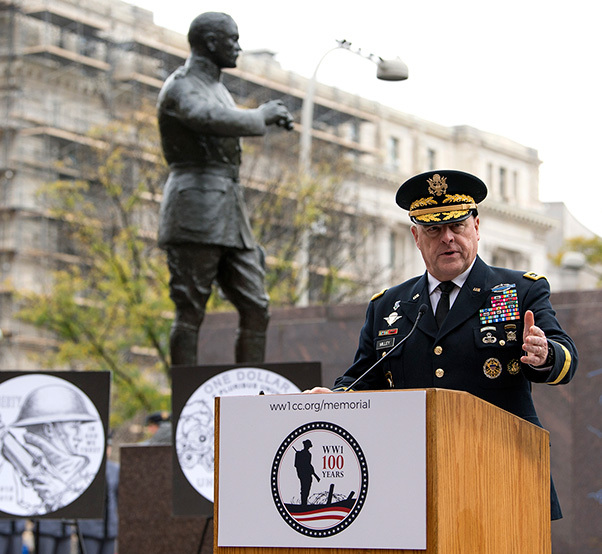 The new memorial to those who served in World War I will share a space with an existing memorial dedicated to General of the Armies John Joseph “Black Jack” Pershing, who served as commander of the American Expeditionary Forces in World War I. The site is a short walk east of the White House. Chief of Staff of the Army Gen. Mark A. Milley attended the groundbreaking as one of more than a dozen officials. He told those in attendance that World War I provided many lessons learned. Along with lessons in strategy, operations, and tactics, the world also learned lessons in politics and government, he said. Milley said the pre-WWI Army was made up of fewer than 200,000 Soldiers who were spread across the nation in mostly law enforcement-type roles. To accommodate the needs of conflict in Europe, the Army grew quickly to some 4 million Soldiers. Still, the United States military was unprepared for that conflict. Chief of Staff of the Army Gen. Mark A. Milley speaks at the ceremonial groundbreaking for the National World War I Memorial at Pershing Park in Washington, D.C., Nov. 9, 2017. Construction of the memorial is expected to be completed in a year. 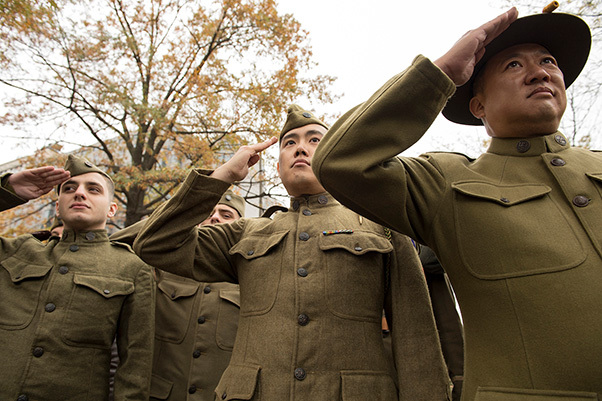 Milley said the new World War I memorial will help Americans today fulfill their duty to remember what has happened in the past, and to honor those who sacrificed. 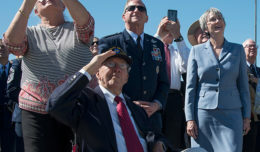 Seated next to Milley at the ground-breaking event was Joe Weishaar, the now 27-year-old architect, who at just 25 was chosen to design the memorial. It will be Weishaar’s architectural design, and the artistry of sculptor Sabin Howard, that will finally provide a memorial to give those World War I veterans the recognition they earned, but never asked for. 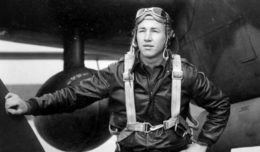 “It may be long overdue, but today marks another point in the journey of making sure they are not forgotten,” Weishaar said. Weishaar said it was back in June 2015 that he first saw a notice advertising a design competition for a national World War I memorial to be based in Washington, D.C.
World War I re-enactors salute during the National World War I Memorial groundbreaking ceremony at Pershing Park in Washington, D.C., Nov. 9, 2017. Construction of the memorial is expected to be completed in a year. At the time he’d never been to the nation’s capital, he said, and had just assumed such a memorial already existed there. “We had memorials to the other notable three wars of the 20th century,” he said. After reading that notice announcing the design competition, he said he went online to research WWI, including photos from the war that he found through the National Archives. The centerpiece of the new memorial will feature a large bas relief bronze sculpture that follows a single Soldier through his own personal World War I experience, beginning with that Soldier leaving home, and his daughter handing him his helmet. Other scenes depict the Soldier marching off to war, fighting, and eventually returning home. Other elements in the memorial will include a pool and green space. The World War I Centennial Commission expects the new memorial to be dedicated Nov. 11, 2018, which is the 100th anniversary of Armistice Day, marking the end of World War I.